Including clinical research sites in regulatory inspection preparedness planning is among the most effective actions sponsors and CROs can take to build positive relationships with sites. 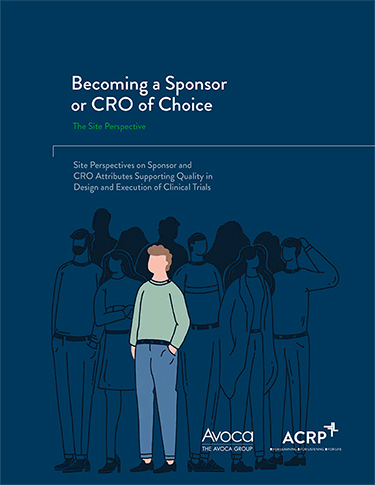 In this white paper, “Becoming a Sponsor or CRO of Choice: The Site Perspective,” findings from research conducted by The Avoca Group over an 8-week period in early 2018 are explained. In the research, investigational sites were asked to rate sponsor and CRO attributes (including responsiveness to questions, knowledge of the study protocol, and frequency of CRA turnover, among others) and study execution (including setting of realistic patient recruitment goals, design of CRF, and ease of EDC systems). The white paper contains key findings as well as recommendations for sponsors and CROs who want to become “partners of choice” with sites.